Anzac Sights and Sounds showcases the New Zealand and Australian film, audio and visual archives of World War 1. Developed in collaboration with Ngā Taonga and the Australian Film Archive, the project brief was simple: video was to be the star of the site. We worked with Ngā Taonga from the outset, using creative activities and exercises to help them form their project vision. This process gave them the opportunity to solidify their thoughts on the outcomes they wished to achieve. The concept phase also informed the direction of our design team. Their interface design creates a delightful network of connections between the potentially overwhelming wealth of resources on the site. The design aesthetic, including the layering of images, gives a hint of what it might feel to be in the trenches. 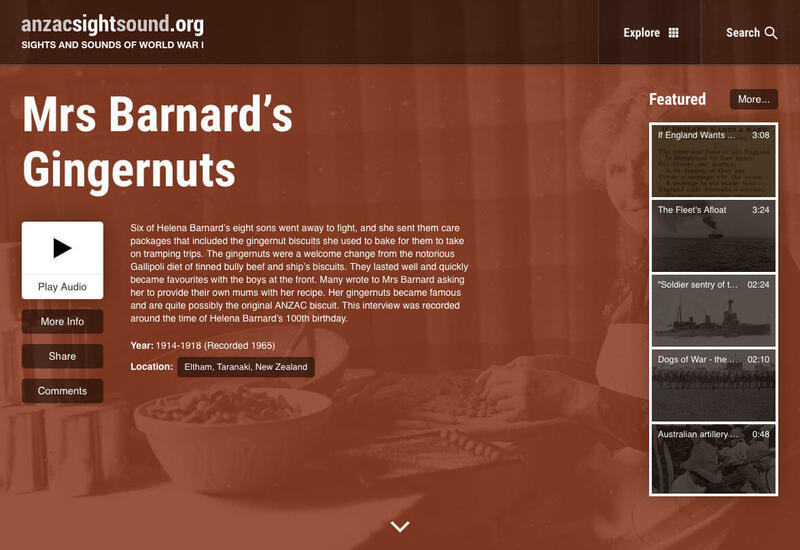 We worked very closely with the Ngā Taonga team to produce a site showcasing their World War 1 content that is clear and interactive and that lets users discover content in an organic way.